30 October 2017 Marcin Dudek’s new exhibition at Edel Assanti, ‘Steps and Marches’, pulls you in from the second you walk through the door. Bright, thumbnail-sized photographs in stark black frames are installed in the first room, jewel-like. In the second, beyond a full height turnstile sculpture, you can catch glimpses of orange walls. Contrasting against the clean white of the reception room, the bold colour is enticing and intriguing. As soon as I approached the first set of photographs, however, that curiosity turned to discomfort. Examined up close, the small images are revealed to be images of unrest, showing hooliganism that Dudek was involved in during a 1995 football match between Poland and Romania. Taken from his personal archive, these intimate images which before seemed so alluring suddenly seemed to implicate, involving the viewer in the violence. The personal nature of this work speaks to Dudek’s practice more widely. Over a number of years, he has been exploring group behaviour and crowd control through the context of the stadium, posing questions about responsibility and autonomy while working through his own past. 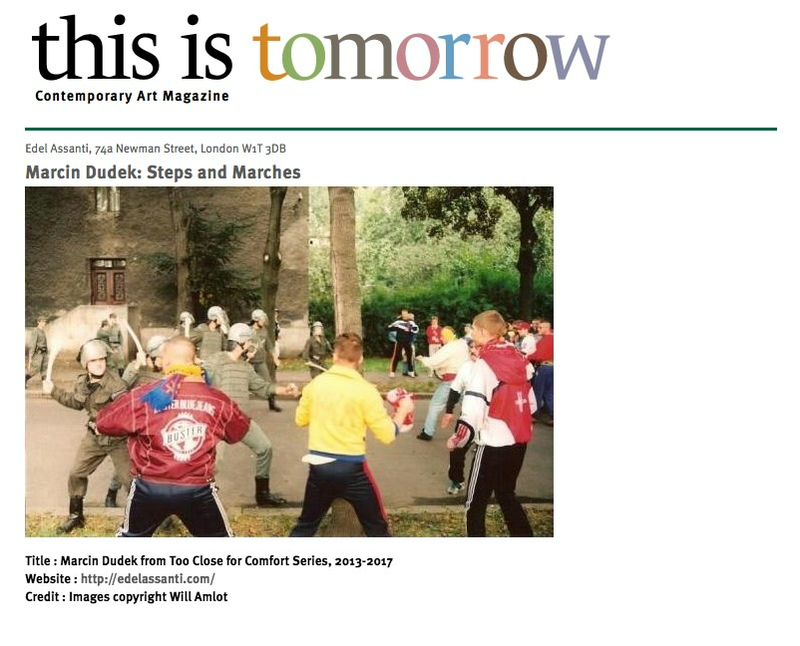 In an exhibition running concurrently in Brussels, Dudek focuses on individuals, but in ‘Steps and Marches’ he is investigating mass movement in general. When you do enter the second room, squeezing past the imposing turnstile, the work seems to be tense, poised in the moment before action and full of latent potential. In one corner of the room, a sculpture comprised of jesmonite casts of stadium seats appear frozen in mid-air. The seats have already been ripped away, ready to be used as weapon or shield. In the opposite corner, a concave sculpture made of glass and silicone and adorned with rubber bullets almost acts as a funnel. While the bullets are suspended, their downward trajectory is inevitable. In another corner, a cast of an Adidas tracksuit is pristine and white, but in this violent setting, the implication is clear – it won’t stay that way for long. you step into a world ruled by the crowd. It is hard to understand the mindset of the hooligan, to relate and humanise acts of senseless violence. The brilliance of ‘Steps and Marches’ is the way that it highlights how things can escalate, how you can find yourself involved with things you never expected. Without shrinking from the horror of his violent past, he owns his personal history but leaves the viewer unsettled. What drives a mob? How do things escalate? What is a person capable of?